Traditional slide-based presentations are just that: Traditional. You could have fantastic visuals, but no matter how fancy (or austerely minimalistic) each slide is, it remains a slide. 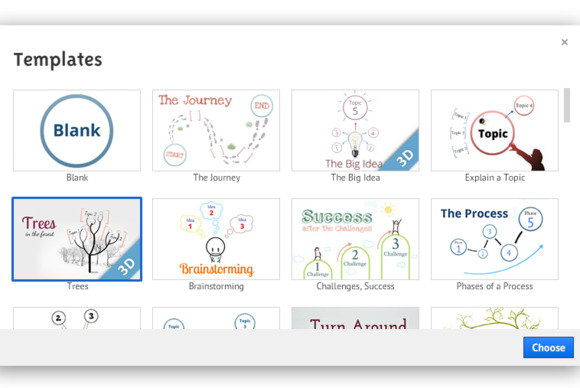 Prezi (various prices, starting at free) tries to change this by turning your presentation into a wide-open canvas on which you can draw your ideas spatially, and then presenting them by zooming and panning all over the canvas. Used well, the end result feels cinematic and engaging in a way traditional presentations rarely are. Prezi offers over 50 templates to get you started. 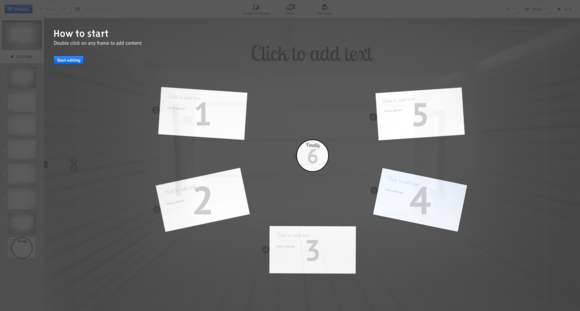 To get you started, Prezi shows a list of templates you could use. There are an ample number of templates, but there is no way to preview what a template looks like except by starting a project with it. If you start a project with a template and find out it doesn't work for you after all, you can switch over to a different template midway through, but you will have to adjust things to work in the new template. Prezi uses a canvas, but makes it easy to see how a presentation flows. 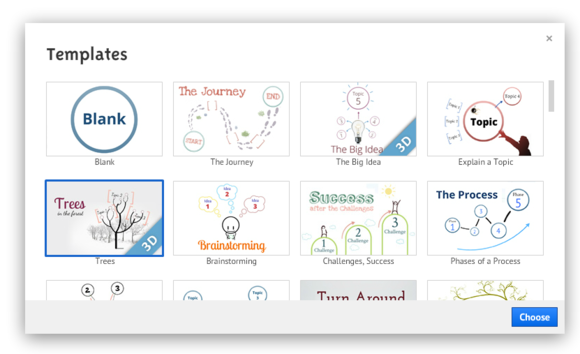 Prezi's canvas-based nature means that you create the presentation where you'll be showing it. If you want to zoom and pan somewhere when presenting, you'll have to zoom and pan while editing, so you instantly get a feel for what your audience will see. Instead of "slides," Prezi uses "path points": saved states for your presentation, where the viewport shows a portion of the canvas. It is easy to insert images using a built-in Google Images search, or from your local computer. As you present, you move through a progression of these path points, with Prezi automatically animating things as needed. 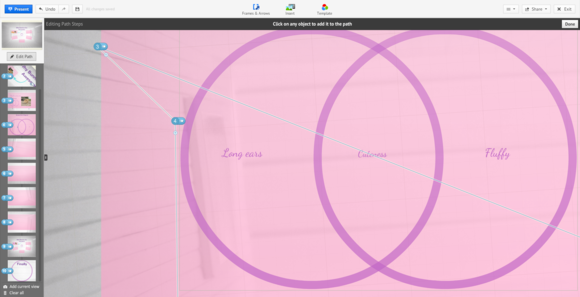 If a given path point covers a small area of the canvas, Prezi will smoothly zoom into it, revealing new details as needed. If the next path point is all the way across the canvas, Prezi will smoothly pan there. 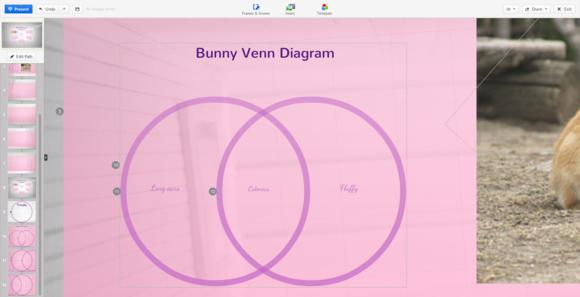 I found Prezi easy and intuitive to work with, without much of a learning curve. 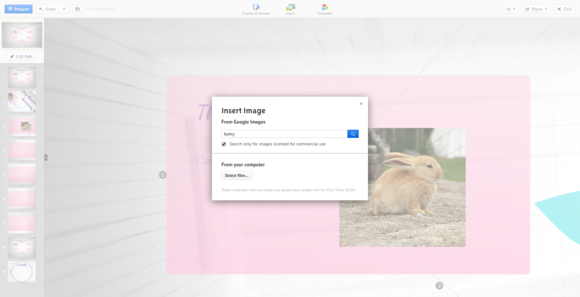 When I had to insert an image, it let me search Google Images right from within Prezi, and I could tell it to only look for images that are okay to use commercially. You can also embed YouTube videos, as well as content from your local computer. A recent Prezi feature is the addition of sound: You can now upload sound clips to go along with your presentation, or even narrate the entire presentation so that it can stand on its own. Instead of slides, your presentation flows along path points, which you can change and edit as needed. Internet connections have a tendency to flake out at just the wrong moment, especially in a busy convention center. To avoid potentially embarrassing situations, Prezi lets you download your presentation for offline viewing. The presentation is packaged as a Zip archive, with a small executable player. Prezi lets you present to others online. Prezi is available in three different plans, starting with a free Public plan. I tested the $4.92/month Enjoy plan. The $13.25/month Pro plan is the only one that lets you work offline. A big part of Prezi's appeal is that it's still unusual. It is likely your audience is used to slide-based presentations, so Prezi's cinematic nature would wow them. In time, if Prezi or similar products become commonplace, it may lose its visual edge. Until that happens, Prezi is an almost surefire way to create an engaging, surprising, and beautiful presentation. Prezi is fun to use, and the presentations you can make with it are fun to watch.